McALLEN — The now-former state district judge accused of allegedly accepting bribes in exchange for judicial favors faces a new federal charge. 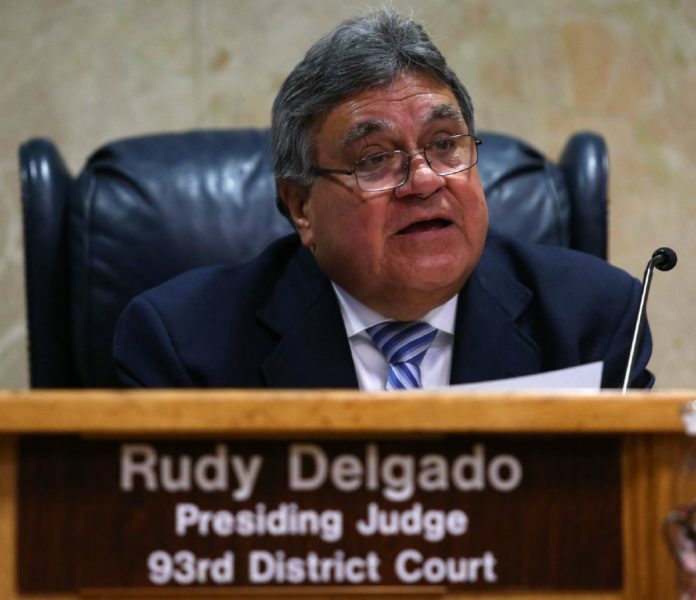 On Wednesday, government prosecutors filed an obstruction of justice charge against Rodolfo “Rudy” Delgado related to his current bribery case. “… Delgado did corruptly obstruct, influence and impede an official proceeding, that is a federal grand jury proceeding, and attempted to do so by, among other things, sending a text message to Attorney A that falsely claimed that the $5,500 cash bribe Delgado received from Attorney A was a campaign contribution and that Delgado did not realize that the approximately 1-half inch thick envelope with approximately 75 bills was not a check,” the indictment states. Government prosecutors allege that Delgado was fully aware that what he had received from Attorney A was a cash bribe, and not a campaign contribution made out in a check — specifically because the envelope in which it was delivered was “1-half inch thick,” and had about 75 bills inside. The government alleges that Delgado must’ve learned of the possible federal investigation into him and was attempting to deceive federal agents about the alleged briberies, who at that point were working with “Attorney A,” the attorney who allegedly bribed Delgado on several occasions. This brings the number of charges Delgado faces at his upcoming September trial to eight charges, the most recent being a conspiracy charge leveled against him in late June. Delgado now faces three counts of federal program bribery, three counts of violating the federal Travel Act for using a phone to broker the bribes, one count of conspiracy to commit bribery concerning programs receiving federal funds, and the obstruction of justice charge, court records show. “Attorney A” is believed to be Edinburg attorney Noe Perez, long rumored to be the informant in the government’s investigation who flipped on Delgado. Perez pleaded guilty in May to one federal bribery charge, court records show. The government alleges that Delgado solicited and accepted cash from Perez in at least one case involving a federal program. Perez, who has more than 16 years of practicing criminal and civil law in Texas, admitted to “knowingly and willfully, conspiring with Delgado to commit offenses against the United States” — this included bribery related to federally funded programs “to corruptly give, offer and agree to give things of value to Judge Delgado,” states the criminal information document against Perez. The document further referred to Delgado as an agent of the state of Texas who received federal benefits in excess of $10,000. The government also alleges that about a year into their alleged conspiracy, in November 2008, Perez acquired a $15,000 pickup truck for Delgado in exchange for benefit in a case involving a client with the initials “E.M.” that was pending in Delgado’s court docket. Perez is due back in a Houston federal courtroom Dec. 6 for sentencing in connection with one count of conspiracy to commit bribery concerning programs receiving federal funds, court records show. He faces a maximum five years in prison, and up to a $250,000 fine. The 65-year-old former judge resigned in late April, and is expected before the court on Aug. 3 to be formally arraigned on the new obstruction charge. In early July Delgado pleaded not guilty to the conspiracy charge, court records show. The government will also seek to seize more than $26,000 of real property from Delgado should he be convicted.